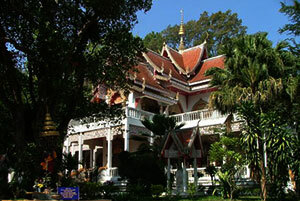 Wat Ram Peng (Tha Po Tharam Temple) is an old temple. Has special pagoda design in Chiang Mai just has only 3 pagodas Base of pagpda has three square, and has stacked seven layers on top. Buddha sat and pavilions. On the top of pagoda has a small bell .This is receive influence of Sukhothai art.